Spontaneous closure of VSD is a well recognised phenomenon, than ASD though both happen in equal frequency.The simple reason being VSD is a noisy disease , ironically the smaller the size of VSD more noisy it is . Hence it is rarely missed while ASD is largely silent in children. For this reason it is possible ASD may be the most common congenital disease . 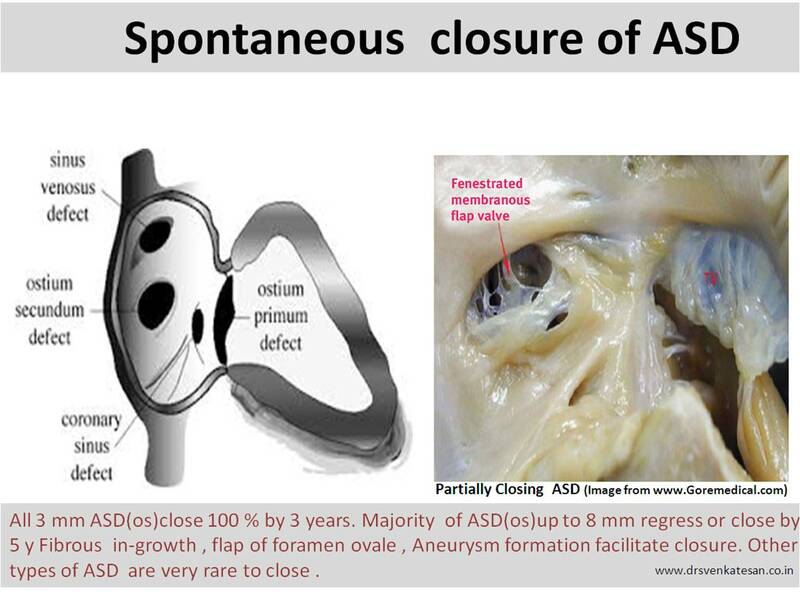 Bulk of the ASD < 8 mm close spontaneously by 5 years. Fenestrations and Septal aneurysms also favor spontaneous closure. Why SVC and primum defect do not close easily ? Plane of ASD secundum is single and bridging of tissue is possible . Sinus venous and primum defects exhibit holes which run in multiple planes hence approximation not possible . They also do not have a valve mechanism. In the current era, one more force interferes with spontaneous closure of ASD . It comes from the hyper trained aggressive Interventional cardiologists who compete with the nature and easily prevail over it ! 1.Craig RJ, Selzer A. Natural history and prognosis of atrial septal defect. Circulation. 1968;37:805–815. 2.Hanslik A1, Pospisil U, Salzer-Muhar U,Predictors of spontaneous closure of isolated secundum atrial septal defect in children: a longitudinal study.Pediatrics. 2006 Oct;118(4):1560-5. 3.David Radzik, André Davignon,Nicolaas van Doesburg, Predictive factors for spontaneous closure of atrial septal defects diagnosed in the first 3 months of life J Am Coll Cardiol. 1993;22(3):851-853. Iam saying it as PFO . . . How do you say it is an ASD ?